Top Blade Steak – Stampede Meat, Inc. This steak is well-marbled, juicy and has excellent beef flavor. 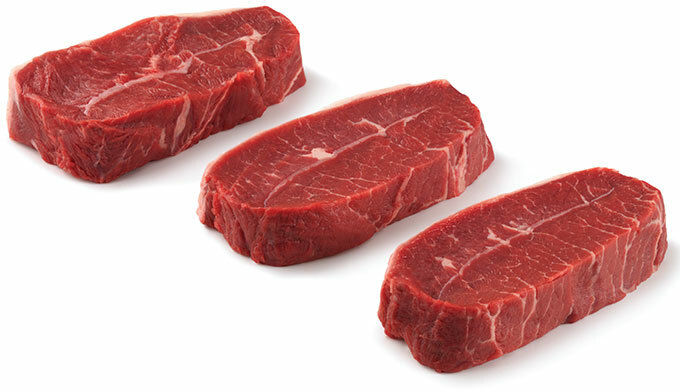 This cut is similar to the Flat Iron steak, however, has the tough connective tissue in the center. Nutrition information per 3-ounce cooked serving: 173 calories; 9 g fat (3 g saturated fat; 4 g monounsaturated fat); 22 g protein; 0.3 mg vitamin B6; 3.0 mcg vitamin B12; 2.4 mg iron; 7.6 mg zinc.